The 21-year-old becomes Ireland’s 23rd medallist at the event. IRELAND’S MARK ENGLISH has followed up his bronze medal at last year’s European Athletics Championships with a silver in this afternoon’s 800m European indoor final in Prague. The 21-year-old from Letterkenny becomes the fifth Irish athlete to win silver at the Championships and 23rd medallist overall. After finding himself towards the back of the six-man field at the halfway point, English timed his charge to perfection in the final 200m to cross the line in a time of 1:47.20, three hundredths of a second outside his season’s best. English strolled through yesterday’s semi-final and showed all his race awareness in the final to bide his time before storming past Sweden’s Andreas Almgren on the home straight and then pipping Netherlands’ Thijmen Kupers. Poland’s Marcin Lewandowski took gold. In the 1500m, Dubliner John Travers finished seventh in his first major Championships final. You can watch Mark English’s race below. 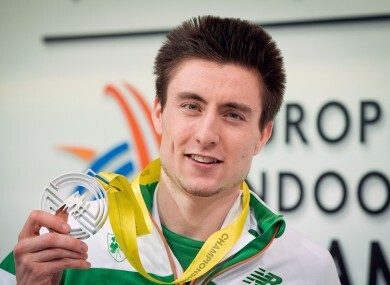 Email “Silver for Ireland as Mark English finishes second at European Indoor Championships”. Feedback on “Silver for Ireland as Mark English finishes second at European Indoor Championships”.